The IAR publishes a bi-annual report in the German language, in which it provides an overview of its scientific activities and presents current research in a format aimed at scientists and the general public alike. 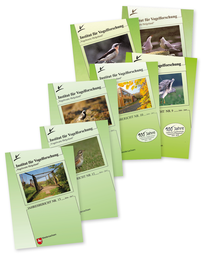 The IAR, in collaboration with the MPI for Ornithology, the bird ringing centre Hiddensee and the German Ornithological Society (DO-G), publishes the German journal "Vogelwarte". This journal has been published since 1945 and comprises four issues each year. Editorial duties lie with Dr. Wolfgang Fiedler (MPI), Dr. Ommo Hüppop (IAR), Dr. Christof Herrmann (bird ringing centre Hiddensee) und Dr. Christoph Unger (DO-G). Peer-reviewed scientific publications from the IAR appear in both national and international scientific journals. An overview of these publications can be found here.